At 24 years old, Giannis Antetokounmpo is the best basketball player in the world. He is the best offensive player on a top-five NBA offense. He's the best defensive player on the No. 1 defense. 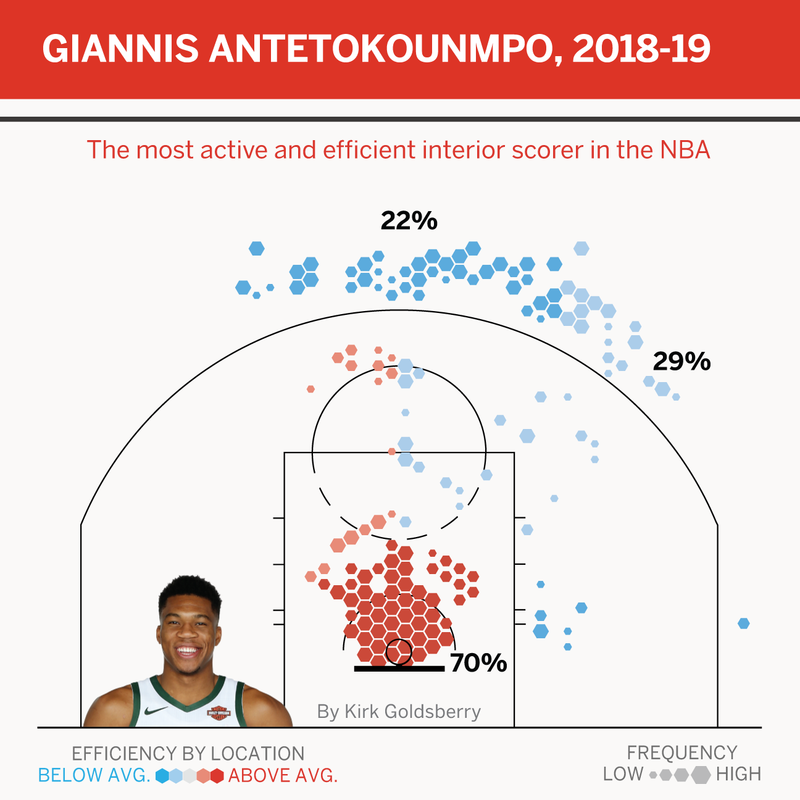 As the catalyst of an incredible basketball system, Giannis has led the Milwaukee Bucks to the best record in the NBA and home-court advantage throughout the playoffs. With respect to Houston's bearded prophet, Antetokounmpo isn't just this season's MVP. He is the perfect two-way superstar for where the NBA is right now -- and where it's going. Let's start on offense -- specifically Giannis' favorite spot on the floor. Antetokounmpo has quickly surpassed some dude named LeBron James as the league's premier interior force. He also is doing things we haven't seen since Shaquille O'Neal was in his prime. If the NBA analytics era has taught us anything, it's that the best shots in the game occur either beyond the arc or near the hoop. The Bucks bask in both zones. Giannis makes hay at the rim, yet he does it so much better than everyone else, partially because his team is woke to the spacing movement. "If you don't knock down shots, then everybody's gonna be in the paint," Antetokounmpo told ESPN.com last week. "[My teammates have] been making shots all year, so it gives me a lot of space to make plays for them and myself." Simply put, he has become the most self-sufficient dunker we've seen in decades. After dropping 19 unassisted dunks as a rookie in 2013-14, Giannis reached 116 this season -- the only guy to top 100 for as long as the league has been tallying play-by-play data. But Giannis plays a completely different game than those other two supermen. He handles the ball, he faces up, he drives. Those guys played in the low post. "I think the thing that's so unique and different about how Giannis is dominating in the paint is that lots of times he's starting with the ball outside the 3-point line -- and still finishing in the paint," Bucks head coach Mike Budenholzer said. And there's just something especially satisfying about an unassisted driving dunk. It's such a dramatic display of dominance. It's why in many of his best highlights, Giannis looks like a man among boys. But then you remember this is the best basketball league on Earth. Every NBA player would love to dribble up the court and slam it home at will. They can't. Yes, that unassisted dunk stat is a little esoteric, and it might not translate directly to wins, but it does reveal just how unprecedented this kid's dominance is right now. By surrounding Antetokounmpo with a fleet of long-range shooters and stationing them on remote perimeter outposts, Budenholzer has unleashed the NBA's most dominant interior scorer. "We have so much spacing," Antetokounmpo said. "I've got stronger and I'm able to get in there, play through contact now, and go up and finish the play." In the NBA, stars aren't born, they're built, and Giannis has built himself in the weight room. All that extra strength is important. Remember this guy? Spacing starts at the rim, and Milwaukee's ferocious interior minister is the most critical component of the most prolific 3-point offense in the Eastern Conference. Between Giannis' physical development, his accelerated skills and Budenholzer's offensive architecture, the Bucks went from 27th overall in made 3-pointers in 2017-18 to second in 2018-19. "His ability as a passer and a playmaker has been so important to us," Budenholzer said. "And he's already ahead of where any of us envisioned. "He takes a lot of pride in being a playmaker." The passing highlights will never go as viral as the dunks, but they are more important. After creating only 8.4 assist opportunities per 100 possessions as a rookie, Antetokounmpo doubled that number this season (up to 17.0), per Second Spectrum tracking. He ranked fourth in the NBA in total 3-point assists. Although the step-back 3 is quickly rising in popularity, more than 82 percent of NBA 3s are still assisted. The secret to increasing 3-point offense is finding players and actions that can generate clean looks on the perimeter. Giannis is one of those players, and Budenholzer's playbook is chock-full of those actions, but the front office helped too. The offseason addition of Brook Lopez was a stroke of genius. Last season, John Henson was the Bucks' starting center. Henson can't space the floor. He doesn't shoot 3s. Lopez came in and immediately became the team's most prolific deep threat. Opponents have to station a big man out on the perimeter even when Lopez doesn't fire away; "Splash Mountain" has opened up the interior, helping Giannis become more efficient than ever. "[Lopez] has done a lot, because his man is not in the paint," Antetokounmpo said. "One thing that I tell Brook every time when the game is starting is, 'Shoot the ball. Doesn't matter if it goes in. Shoot the ball.' Because I know the guy will have to come out and guard him." Antetokounmpo wouldn't look this good without Budenholzer's offense or his friends on the perimeter, but organizational competence shouldn't hurt his best player case. His main competitor for the MVP award, James Harden, also benefits from the strategic alignment of front office, head coach and superstar. The best organizations in the league always have embraced some kind of fitting structure, and the most successful ones put their best players in conducive habitats, just as general manager Jon Horst and Budenholzer have done with Giannis. Regardless, Giannis is probably not the absolute best offensive player in the league -- at least not yet. But he doesn't have to be. The Bucks' offensive improvements have been remarkable -- they ended the regular season with the best offense in the East -- but as crazy as it sounds, that pales in comparison to Milwaukee's defensive awakening. There was always a defensive juggernaut buried in this roster. For years, the Bucks have had a reputation as one the longest, most athletic rosters in the NBA. But previous coaches just couldn't crack the code. Last season, the Bucks ranked 18th in defensive efficiency. This season, they ranked first, and many of their NBA-best 60 victories have more to do with getting stops than they do with getting buckets. The entire culture around the team has changed. That's most evident on defense. Budenholzer redesigned the defensive playbook. Whereas last season's team was overaggressive at the point of attack and gave up more layups than anyone, this season's team is the opposite. The Bucks run arguably the most conservative pick-and-roll defense, happy to keep their big men in the paint and give up perimeter looks as long as they protect the rim. It's playoff time. Don't miss these games. Giannis is the best defender on the team and arguably the most versatile defender in the league. He can protect the hoop. He can guard on the perimeter. He is a nightmare in transition. His ridiculous mix of size, athleticism and length essentially enables the Bucks to have an extra big man on the floor at all times without getting slower. Forget MVP for a second. You could argue Giannis should win the Defensive Player of the Year Award too. I'll make his case right here with four quick stats. Stat No. 1: Of the 216 players (almost half the league) who have defended at least 100 shots at the rim, nobody has been a more effective rim protector than Giannis. Per Second Spectrum tracking, opponents convert just 52.7 percent of their shots at the rim when Giannis is the closest defender. Jayson Tatum knows. Stat No. 2: Antetokounmpo ranks second in the NBA in defensive rebounding. Stat No. 3: Of the 206 players who have played at least 50 games and averaged at least 20 minutes per game, Giannis has the third best defensive rating -- and the highest such mark on the team with the best defense. Stat No. 4: Antetokounmpo and Robert Covington are the only wing players in the top 20 in ESPN's defensive real plus minus. When Antetokounmpo isn't making plays as a primary defender, he is a terrifying free safety. Out of 78 players who have provided help defense on at least 300 drives this season, he has been the best, holding opponents to a measly 0.82 points per chance, according to Second Spectrum data. And when teams are silly enough to isolate against him, he has been fifth best at stifling that nonsense -- among 135 players to defend at least 100 such plays -- allowing just 0.74 points per chance. The numbers are impressive, but the footage is even better. Giannis has the NBA's best defensive highlights. Just ask Blake Griffin. Imagine a defender as punishing as Rudy Gobert and an offensive star nearly as dominant as Harden. That's Giannis. Still, defense remains woefully underappreciated in player valuation. Not only is it hard to measure, but it's boring. Whenever a decent scorer is also a strong defender, he is labeled a good "two-way player." But here's the thing: This isn't football. Everybody is a two-way player in this sport, and its best players excel on both ends of the court. For years, we didn't have enough data to even try to quantitatively value individual defensive performances. In turn, even the most sophisticated MVP debates -- Giannis vs. Harden, Russell Westbrook vs. Kawhi Leonard, you name it -- can overlook the unglamorous arts of stopping dudes. We still have a long way to go. Basketball has borrowed a lot from baseball, including an attempt to measure and catalog every statistical event. NBA defense isn't event-based, and defensive play involves constantly doing stuff that is hard to tally in spreadsheets. The best defenders in the sport are constantly suppressing shots, intimidating opponents, stifling sets and disrupting offenses in ways that are inconvenient (or impossible) to count. Basketball also has modeled its most prestigious individual award after America's pastime. Major League Baseball introduced the most valuable player award in 1931, decades before basketball did. Trying to identify and award the best player in a sport at the end of the season isn't unusual. However, those first two words -- most valuable -- make things weirder than going with best player or most outstanding or whatever. That's how we end up in unanswerable debates. No one will totally agree on what is valuable in the game of basketball. While the analytics era of the NBA has helped us quantify value in dozens of new ways, our accounting framework and discourse still remain skewed toward offensive numbers. It's within this environment that terrible defensive players still get paid millions of dollars. It's within this framework that the stank of superstars on the defensive end gets obscured by buckets. This season's MVP vote will probably be close. But the league's best team has a superstar who is clearly the best two-way player in the world's best two-way sport. What is more valuable than that?